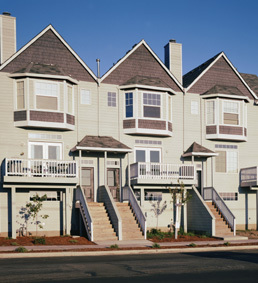 Typically, condominiums are purchased to provide shelter - to be our homes. Additionally, we want our investments to increase in value over the long term. Key to meeting this goal is the implementation of sound maintenance and rehabilitation. As your property managers, we will advise you of the appropriate schedules for your particular site. Listed below is an example listing of the services Empire Property Management performs to ensure your investment continues to increase in value. Create strategic points of interest that enhance curb appeal. Typically, these points of interest can be implemented in a very cost effective manner by using native plants and other low maintenance landscaping techniques. Enforce the rules and regulations of the homeowners' association to maintain the vision designed by the association. The clubhouse and other amenities, such as tennis courts, pools, and playgrounds, often highlight an association's commitment to the property. We believe it is very important to maintain these facilities so they sparkle and attract prospective buyers along with garnering top dollars for sellers. Clean sidewalks, pavement in good repair, and tidy refuse collection areas also lead to increased property values and are a hallmark of the services offered by Empire Property Management. Contracts with vendors are comprehensive and highly detailed to make certain that "unexpected surprises" are avoided or at the very least kept to a minimum. Board approval is sought prior to implementation of projects. We exclusively use licensed and insured contractors that have a proven track record. Our contractors take pride in their work and only use acceptable building techniques rather than shortcuts. The property manager maintains close supervision of projects and contractors to ensure that projects are completed within budget. Empire Property Management has implemented a custom database to track all calls into the office. We keep track of who called, the concern at hand, and the follow-up activities associated with each call. Using the above mentioned database, we are able to maintain frequent written communications with unit owners in the form of post cards with regard to upcoming projects as well as the current status of issues that are of concern to them. Personal visits by the property manager are made on a routine basis to maintain contact with unit owners and to make visual inspections of the property. Accurate financial records are a key concern to unit owners and the staff of Empire Property Management. We use state of the art computerized software to maintain each of the properties we manage. A variety of financial reports are made available to board members each month. In addition, these reports can be reviewed by unit owners by simply scheduling an appointment with the Finance Manager. Let the Empire Property Management team assist you in achieving your property management goals. © 2019 Empire Property Management Corp.